If you listen to podcasts, you have no doubt heard the phrase ‘Lumosity: Brain games by real neuroscientists’. The idea is simple: Much like the mundane, repetitive tasks like running and lifting weights have positive real-world health benefits, tasks like figuring out if arrows are going up or down or performing math could have positive real-world benefits for your thinking. This concept builds upon the idea that the brain changes depending on how you use it. Examples include studies that document changes in specific parts of the brain related to job requirements, such as in cab drivers in London (1) and professional musicians (2). Lumosity proposes to harness this process by having people repetitively practice specific mental tasks with the aim of improving their ability to think. A specific example is in having older adults at risk for alzheimer’s perform these mental tasks to try and slow or reverse mental decline due to age (3). And it is not just Lumosity, but a multitude of companies such as Posit Science and Cogmed that make up an industry currently $1.3 billion in size, which is projected to grow to $6 billion by 2020 (4). Given the obvious appetite in society for brain training, an appetite which is projected to increase exponentially for the foreseeable future, this controversy will only gather more attention moving forward. For every study that claims repetitively practicing a mental task increases IQ (6) there is a study which claims that repetitively practicing a mental task fails to improve performance on any other task (7). Questions about the effectiveness of brain training are better suited to be the subject of a couple dozen doctoral dissertations rather than the subject of a humble blog post. But we can begin by examining the most basic question about brain training: Can practicing one task improve your ability to perform a second task that you did not practice? Figure 1. A/B/C) Areas of the brain with increased cortical grey area after juggling practice, shown here to be in visual areas sensitive to visual motion. D) Percent change in the area identified in the figure. At scan 1, before any practice juggling, no increases are seen. However, at scan 2 after multiple weeks of practice an increase of 3% in grey matter volume is observed. After multiple weeks of not practicing juggling participants brains show a loss of some of the gains from their earlier practice. When you do bicep curls, you are not actually interested in getting better at lifting heavy objects repeatedly from your waist to your shoulder. Rather, by increasing the strength of this particular muscle, you are increasing your ability to unscrew the top off the jar or throw a ball farther. But to begin to understand how the bicep curl will help in these more complicated operations, it is important to understand what changes the bicep curl is actually causing. You are not actually increasing the number of muscle fibers in your body when you weight train, but rather changing various aspects of the muscle fibers you already have (Check out reference 8 for more information than you’ll ever want about strength training). What changes take place in the brain in response to ‘mental exercise’? A straightforward change that has been studied for several decades is the idea that similar to a muscle growing with exercise, ‘grey matter’ in the brain also increases in volume with mental exercise. This grey matter is where the primary cells of the brain (neurons) reside. Much like muscle increase not being the creation of new muscle, increases in the size of grey matter are likely to be related to more complicated changes such as increases in cellular size or enlargement of blood vessels the area (9). The increase in volume is observed with Magnetic Resonance Imaging (MRI). Increases in grey matter have been reported in diverse tasks including juggling (10,11), meditation (9,12,13), playing Super Mario Brothers (14), and reading text in a mirror (15). In the study on jugglers (10) researchers found that participants trained to juggle showed an increase in cortical thickness in motion-sensitive visual areas (figure 1). The study participants stopped juggling after the conclusion of the study and when their brains were imaged again several months later this expansion in volume begin to disappear. Interestingly, the researchers did not observe any change in areas of the brain responsible for controlling muscle movement. This leads to the possibility that different areas of the brain are more or less able to change in response to practice of different tasks. More Practice, Better Functioning Brain? Figure 2. The green areas show areas of the brain active during mirror reading overall. The red region is the area that showed a decrease in activity after practice while the blue area is the region that showed an increase in activity after practice. The white region is the area that showed an increase in grey matter volume after practice. Notice that the white and blue area are partially overlapping. What does this change in grey matter volume mean in terms of actual thought processes? Unfortunately, studies that focus on brain volume do not always assess how, or even if, the brain region that grew actually contributes to task performance. 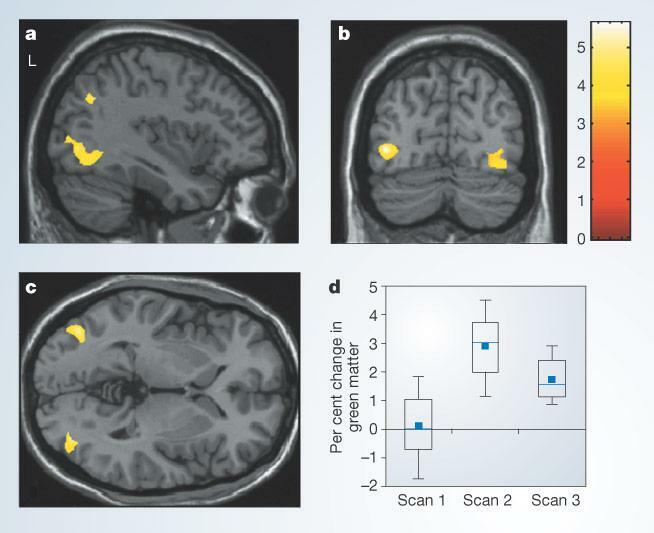 However, the study of mirror reading (15) did just this, showing overlapping increases in grey matter as well as increased brain activity (as measured with fMRI) in visual areas critical to the task (figure 2). Other studies have reported increased activity in brain regions after practice on a variety of tasks(16, 17, 18). An increase in brain activity could be viewed as the recruitment of additional areas within the brain in response to practice. This could mean that an area not previously active could begin to contribute to the task or that an area already active could increase its contribution (19). In addition to the reported increases, decreases in activity after practice have been observed during tasks such as a number of tasks (20, 21, 22). These could be conceptualized as the brain increasing its efficiency with practice, meaning that certain areas of the brain can accomplish the same performance with less effort (19). In the previous studies cited, the same task (such as visual mirror reading) is reported to show both an increase and a decrease in brain activity in response to practice. Part of this is down to the complexity of the what is being studied. Two different research teams studying very similar questions can come away with opposite answers. This should push us to improve methods and to make sure that results are consistent. However, another reason for these discrepancies is that different brain regions respond to practice in different ways. A number of the studies cited above (16, 17, 21) show both an increase in one brain area and a decrease in different brain area (see Figure 2) in response to practice on the same task. In this way, different brain regions may show increased recruitment while others may show increased efficiency depending on the task and on the brain region. Figure 3. The brains in the left column show activity in the brain during the performance of the 3 tasks in this experiment. The LM task (middle) was practiced while the 3-back task (top) was the task that showed the transfer of the increase in performance. The Stroop task (bottom) did not show this transfer of the performance increase. The right column shows the overlap of the brain activation in the tasks, demonstrating far greater overlap of brain regions in the 3-Back & LM (successful transfer) rather than Stroop & LM (no transfer). Transfer of learning means that practicing one task can lead to improvements on an unrelated task. This is most basic demonstration of the concept behind brain training games. Now that we havetaken a whirlwind tour through the possible effects practice can have on the brain, we can ask how these changes could be used when transferring gains from one task to another. Studies have demonstrated that training on a one specific task can lead to increases in very unrelated tasks (23). However, there are examples of training that failed to generalize (24); In this study, despite extensive training in a complex video game, when participants were tested on aspects of the game they had not encountered before they did not perform better than a control group with minimal training. Obviously training tests can be completely different, and if transfers exist is likely to vary depending on a multitude of factors. Indeed, a study which trained two different groups on two different tasks found that each task showed transfer benefits, but the benefits were on separate tasks which did not overlap. Further complicating issues is that another found transfer effects for young adults but not older adults (26). Taking all of this into consideration, what does it look like in the brain when a task does show transfer benefits? One study demonstrates that transfer will occur if tasks engage overlapping brain regions and if the training improves processing in the same region. Researchers set up two tasks that had overlapping activity in several brain regions. They showed that practice on the first task did improve performance on the unpracticed second task and that activity in the overlapping regions was increased for both tasks (remember that an increase in performance is often interpreted as an increase in the recruitment mental resources). However, in a third task which did not overlap greatly in brain regions failed to show an increase in either performance or brain activity (figure 3). Further, when the study was tried in older adults the researchers failed to find any evidence of transfer for any task. So what does all this mean for the soon to be multi-billion dollar brain-training industry? If you are keeping score at home, so far we have seen that brain areas can increase in size, but that only some areas involved in performing a task change volume. Further, we may see some areas increase in activity in response to practice while other areas decrease in activity, depending on the brain region and what it is doing while performing that task. To make matters even more confusing, we have only dealth with changes in single portions of the brain at a time. This doesn’t begin to scratch the surface of the research into practice changing the way different brain regions coordinate and communicate with one another (27, 28). However, amid the confusion several regularities emerge. The first is that different brain regions respond differently to practice To maximize the return from brain training it will be necessary to identify the brain regions that are the most malleable in response to practice and to create tasks that target these specific areas. Second, whether or not transfer occurs is heavily dependent on which tasks are being practiced and what tasks we desire the benefit transfer to. It is likely that some games will have wide ranging benefits, while the majority of games may have limited or no transfer. Third, many games that show transfer benefits in the young fail to show these benefits in the old. If these games are being marketed as a way for the elderly to maintain and even increase brain function, the researchers will need to produce conclusive proof that their methods work in the elderly and not just in the young. Only future research will identify the most effective ways to train our brains and to ensure that the time spent playing these games in more than just a pleasant diversion. 1) Maguire, E. A., Woollett, K., & Spiers, H. J. (2006). London taxi drivers and bus drivers: a structural MRI and neuropsychological analysis. Hippocampus, 16(12), 1091-1101. 2) Sluming, V., Barrick, T., Howard, M., Cezayirli, E., Mayes, A., & Roberts, N. (2002). Voxel-based morphometry reveals increased gray matter density in Broca’s area in male symphony orchestra musicians. Neuroimage, 17(3), 1613-1622. 6) Jaeggi, S. M., Buschkuehl, M., Jonides, J., & Perrig, W. J. (2008). Improving fluid intelligence with training on working memory. Proceedings of the National Academy of Sciences, 105(19), 6829-6833. 7) Owen, A. M., Hampshire, A., Grahn, J. A., Stenton, R., Dajani, S., Burns, A. S., … & Ballard, C. G. (2010). Putting brain training to the test. Nature, 465(7299), 775-778. 9) Lazar, S. W., Kerr, C. E., Wasserman, R. H., Gray, J. R., Greve, D. N., Treadway, M. T., … & Fischl, B. (2005). Meditation experience is associated with increased cortical thickness. Neuroreport, 16(17), 1893. 10) Draganski, B., Gaser, C., Busch, V., Schuierer, G., Bogdahn, U., & May, A. (2004). Neuroplasticity: changes in grey matter induced by training. Nature, 427(6972), 311-312. 11) Driemeyer, J., Boyke, J., Gaser, C., Büchel, C., & May, A. (2008). Changes in gray matter induced by learning—revisited. PLoS One, 3(7), e2669. 12) Hölzel, B. K., Carmody, J., Vangel, M., Congleton, C., Yerramsetti, S. M., Gard, T., & Lazar, S. W. (2011). Mindfulness practice leads to increases in regional brain gray matter density. Psychiatry Research: Neuroimaging, 191(1), 36-43. 13) Luders, E., Toga, A. W., Lepore, N., & Gaser, C. (2009). The underlying anatomical correlates of long-term meditation: larger hippocampal and frontal volumes of gray matter. Neuroimage, 45(3), 672-678. 14) Kühn, S., Gleich, T., Lorenz, R. C., Lindenberger, U., & Gallinat, J. (2014). Playing Super Mario induces structural brain plasticity: gray matter changes resulting from training with a commercial video game. Molecular psychiatry, 19(2), 265-271. 15) Ilg, R., Wohlschläger, A. M., Gaser, C., Liebau, Y., Dauner, R., Wöller, A., … & Mühlau, M. (2008). Gray matter increase induced by practice correlates with task-specific activation: a combined functional and morphometric magnetic resonance imaging study. The Journal of Neuroscience, 28(16), 4210-4215. 16) Olesen, P. J., Westerberg, H., & Klingberg, T. (2003). Increased prefrontal and parietal activity after training of working memory. Nature neuroscience, 7(1), 75-79. 17) van Turennout, M., Bielamowicz, L., & Martin, A. (2003). Modulation of neural activity during object naming: effects of time and practice. Cerebral Cortex, 13(4), 381-391. 18) Schwartz, S., Maquet, P., & Frith, C. (2002). Neural correlates of perceptual learning: a functional MRI study of visual texture discrimination. Proceedings of the National Academy of Sciences, 99(26), 17137-17142. 19) Kelly, A. C., & Garavan, H. (2005). Human functional neuroimaging of brain changes associated with practice. Cerebral Cortex, 15(8), 1089-1102. 20) Garavan, H., Kelley, D., Rosen, A., Rao, S. M., & Stein, E. A. (2000). Practice-related functional activation changes in a working memory task. Microscopy research and technique, 51(1), 54-63. 21) Qin, Y., Carter, C. S., Silk, E. M., Stenger, V. A., Fissell, K., Goode, A., & Anderson, J. R. (2004). The change of the brain activation patterns as children learn algebra equation solving. Proceedings of the National Academy of Sciences of the United States of America, 101(15), 5686-5691. 22) Kassubek, J., Schmidtke, K., Kimmig, H., Lücking, C. H., & Greenlee, M. W. (2001). Changes in cortical activation during mirror reading before and after training: an fMRI study of procedural learning. Cognitive Brain Research, 10(3), 207-217. 23) Chein, J. M., & Morrison, A. B. (2010). Expanding the mind’s workspace: Training and transfer effects with a complex working memory span task. Psychonomic Bulletin & Review, 17(2), 193-199. 24) Lee, H., Boot, W. R., Basak, C., Voss, M. W., Prakash, R. S., Neider, M., … & Kramer, A. F. (2012). Performance gains from directed training do not transfer to untrained tasks. Acta psychologica, 139(1), 146-158. 25) Van Muijden, J., Band, G. P., & Hommel, B. (2012). Online games training aging brains: limited transfer to cognitive control functions. Frontiers in human neuroscience, 6. 26) Dahlin, E., Nyberg, L., Bäckman, L., & Neely, A. S. (2008). Plasticity of executive functioning in young and older adults: immediate training gains, transfer, and long-term maintenance. Psychology and aging, 23(4), 720. 27) Jolles, D. D., Van Buchem, M. A., Crone, E. A., & Rombouts, S. A. (2013). Functional brain connectivity at rest changes after working memory training. Human brain mapping, 34(2), 396-406. 28) Büchel, C., Coull, J. T., & Friston, K. J. (1999). The predictive value of changes in effective connectivity for human learning. Science, 283(5407), 1538-1541. Interesting post. I like how you move from structural to functional brain changes to behavior. That the effects of practice transfer from the trained task to others is crucial if we want to know whether “computerized cognitive training” will have clinical uses. Other very important points are effect size and cost-effectiveness: if there are measurable, transferable benefits, but if those benefits are small, especially compared to their costs (in terms of time invested or actual money spent), then brain training might not be worth it in practice. 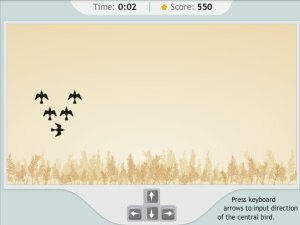 A recent PLOS Medicine meta-analysis found that, although computerized cognitive training did induce transferable improvement in some cognitive tasks, effect sizes were very small. I covered that article on my blog (https://neuroscimed.wordpress.com/2015/01/04/brain-games-not-quite-ready-for-prime-time/).